Kars4Kids is excited to begin this new series about the history of cars. We are going to learn all about how the car came to invented, and about all of the different parts and how they were finally all put together to produce the modern automobile. To start, we are going to learn about the first and the most important part of the car – the wheel! Believe it or not, there was a time when there were no such things as wheels. If something heavy needed to be moved, it had to be carried, either by person or by animal. If someone wanted to travel, he either had to walk, or ride on an animal. Then, someone came up with the idea of a wheel! 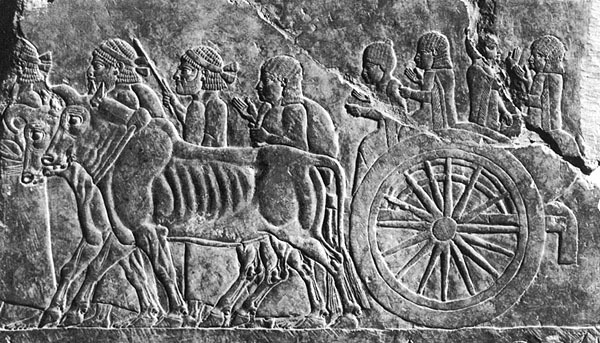 Now, heavy things could be loaded onto wagons, people could ride on carts, and warriors could even use chariots in battle! The wheel addresses the first problem that anyone making a vehicle has to overcome – friction. Friction is the resistance an object encounters when it’s attempting to move against or over another object. Imagine you went the supermarket to buy a big case of water. You go the beverages aisle and select a nice big case. You pick it up and… whoo, that’s heavy! So you start dragging it across the floor to the checkout. As you’re busy schlepping the box across the store, earning a lot of stares, you suddenly spot a shopping cart. What a great idea! Now you can easily bring your water to the checkout, and you can even throw some more stuff in, too! What happened? Why was it suddenly easier with the cart? If anything, the load is now heavier! The answer is: the friction that the case was encountering with the floor is gone. The wheels are able to roll over the floor with no resistance. So the wheel was the first step in enabling a vehicle of any kind to exist. The first wheels were simply round wooden disks with holes in the middle for the axle. These were a bit heavy, so the Egyptians came up with the idea of spoked wheels. This way, the wheels were made up of wooden rims and a series of spokes, making them much lighter. Of course, for thousands of years the only way to power these early vehicles was through humans or animals. Next, we will learn about the first engine!